Are investors running out of steam? Stock markets seem unstoppable these days, with the Dow Jones industrial average and S&P 500 continually climbing to fresh record highs. But more muted trading is likely Tuesday. 1. Seemingly unstoppable: Markets have been on a real hot streak, but it's not guaranteed that we'll see new record highs Tuesday. U.S. stock futures are relatively flat ahead of the open. Prices for oil and gold were inching higher. This follows a firm finish across major U.S. markets on Monday. The tech-heavy Nasdaq was the best performer with a 0.9% gain. 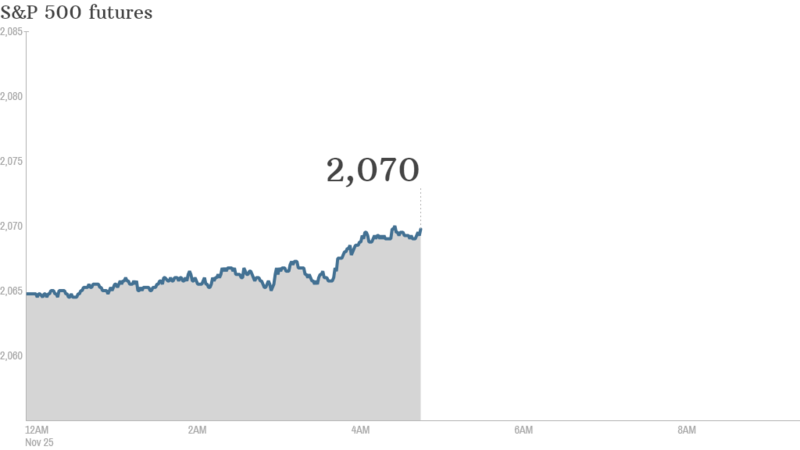 The Dow added just 8 points, but that was enough to seal another all-time closing high. The S&P 500 also rose 0.3% to a record high. 2. Corporate screw-ups -- Twitter, Citigroup, Honda: Twitter's CFO made a massive social media faux pas by accidentally tweeting a message about a potential business acquisition. It's worth watching Twitter (TWTR) trading Tuesday. Citigroup (C) was hit with a $15 million fine after U.S. regulators found Citi wasn't properly supervising some misbehaving equity analysts. The Financial Industry Regulatory Authority found Citi analysts gave stock picks to some clients that were inconsistent with their research. Shares in Citigroup are edging lower in premarket trading. Honda (HMC) admitted in a regulatory filing Monday that it failed to report 1,729 serious accidents resulting in injuries or deaths. 3. Economic news: Kicking off the data dump Tuesday, the U.S. government will issue its second reading of third quarter GDP at 8:30 a.m. ET. The initial reading showed the American economy grew by 3.5% over the period, beating analysts' expectations and providing more proof that the U.S. economy is gaining momentum. The S&P/Case-Shiller 20-city home price index for September is due out at 9 a.m. ET. The numbers give a good overview of the state of the U.S. housing market. At 10 a.m. ET the Conference Board publishes its monthly consumer confidence index. In Europe, official third quarter German GDP data showed the economy grew 1.2%, unchanged from earlier estimates. 4. Earnings: Campbell Soup (CPB) and Tiffany & Co (TIF). will report earnings before the opening bell, and Hewlett-Packard (HPQ) provides its earnings update after the close. 5. International markets overview: European markets were mostly positive in early trading, while Asian markets ended with mixed results.